Still one of our most punishing benchmarks 3 years later, Crysis 3 needs no introduction. 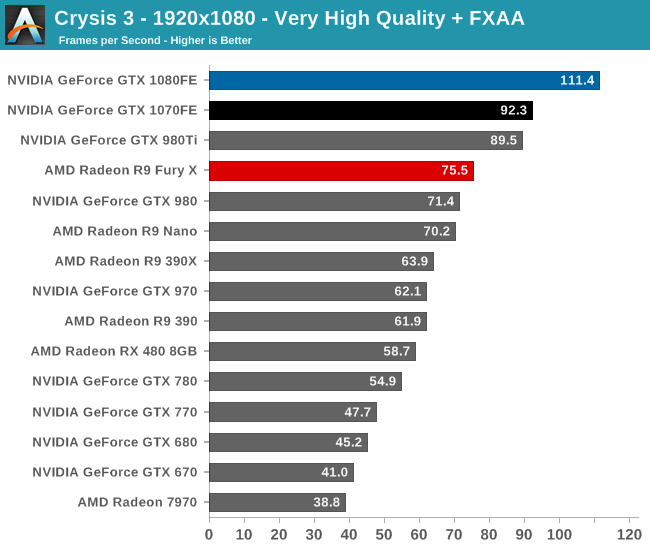 Crytek’s DX11 masterpiece, Crysis 3’s Very High settings still punish even the best of video cards, never mind the rest. 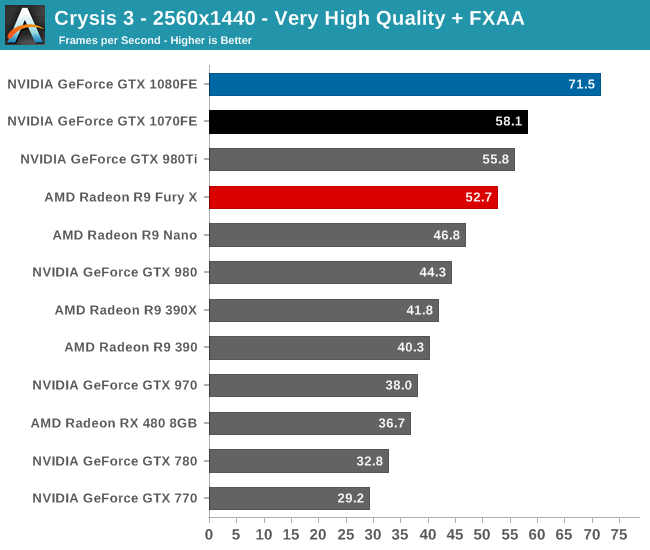 Along with its high performance requirements, Crysis 3 is a rather balanced game in terms of power consumption and vendor optimizations. As a result it can give us a good look at how our video cards stack up on average, and later on in this article how power consumption plays out. This being the first cycle we’ve used the Very High settings, it’s humorous to see a $700 video card getting 35fps on a 3 year old game. Very High settings give Crysis 3 a level of visual quality many games still can’t match, but the tradeoff is that it obliterates most video cards. We’re probably still 3-4 years out from a video card that can run at 4K with 4x MSAA at 60fps, never mind accomplishing that without the MSAA. The GTX 1080 does however at least get the distinction of being the one and only card to crack 30fps at 4K. 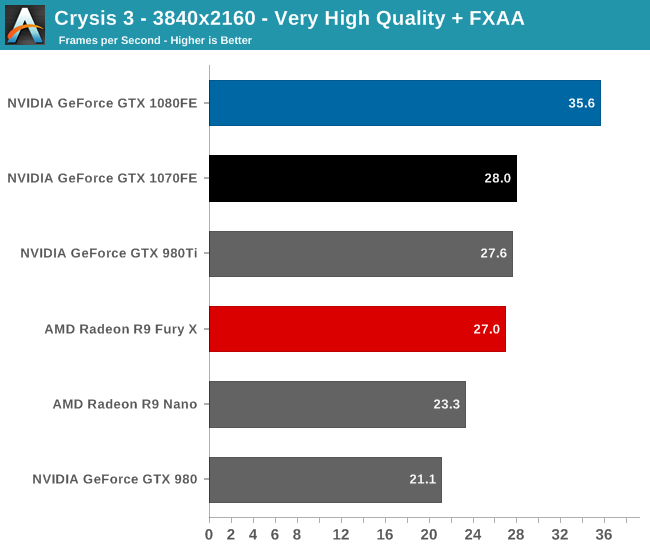 Though 30fps is not suggested for Crysis, it can legitimately claim to be the only card that can even handle the game at 4K with a playable framerate at this time. Otherwise if we turn down the resolution, the GTX 1080 is now the only card to crack 60fps at 1440p. Very close to that mark though is the GTX 1070, which at 58.1fps is a small overclock away from 60fps. Looking at the generational comparisons, GTX 1080 and GTX 1070 lead by a bit less than usual, at 62% and 51% respectively. The GTX 1080/1070 gap on the other hand is pretty typical, with the GTX 1080 leading by 27% at 4K, 23% at 1440p, and 21% at 1080p.